Eugene, OR : Harvest House Publishers, 1992. 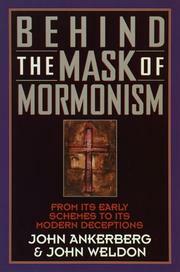 Behind the mask of Mormonism John Ankerberg. 100 ME:PersonalName 0 $a Personal name Ankerberg, John. $c Statement of responsibility John Ankerberg. 300 Physical Desc $a Extent 499 p.
541 Acq Source Note $d Date of acquisition 1997/09/09. 650 Subj:Topic 0 $a Topical term Church of Jesus Christ of latter-day saints. 650 Subj:Topic 0 $a Topical term Mormons and Mormonism. 700 AE:PersName 0 $a Personal name Weldon, John.